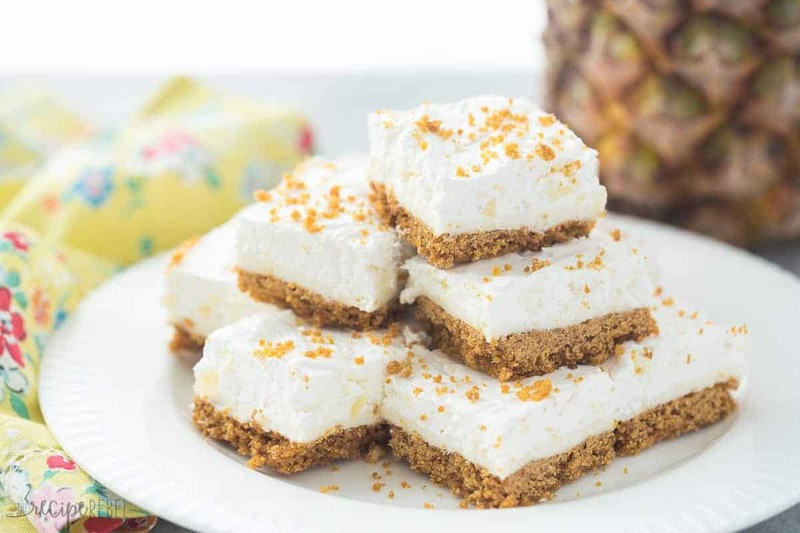 My version of my Mom’s Pineapple Squares — almost no bake dessert that’s perfect for Spring or Easter! Light and fluffy and full of crushed pineapple! So today we’re celebrating the babes of some good blogger friends: Natalie (and baby Josh!) of Tastes Lovely, Jessica of Flying on Jess Fuel, and Izzy of She Likes Food! 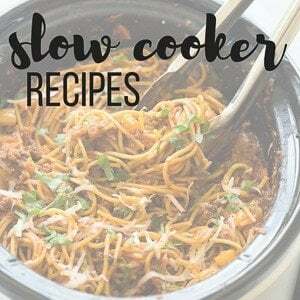 Personally I don’t think there’s any better way to celebrate, well, pretty much anything than good food, so we’ve gathered a bunch of tasty bites and you can find them all in the links below the recipes. When I was trying to think of something I wanted to make, since I knew we were planning for the end of February, I wanted something light and Springy. By the end of February, I am way (WAY) over it being winter and just want some warmth, but often it doesn’t really come until May! My mind went straight to my Mom’s Pineapple Squares — I had this crazy obsession with them when my Mom would make them when we were younger. I don’t even know if I ever really told her how much I liked them (though I’m sure it showed! ), but I remember just loving that overly sweet filling and slight tang from the pineapple. So I went to find my the recipe I scrawled down from my Mom a long time ago, and when I went to make it I noticed it called for raw eggs. Now, I know a few desserts like this that have completely raw eggs, and I personally know that eating raw eggs is actually totally fine as long as they are pasteurized. But I didn’t want to get anyone all worked up about the raw eggs in the recipe and have to justify their use, so I thought maybe it was better if I didn’t make them. Except I couldn’t get them off my mind. I looked at the recipe and figured I could just as easily make them without. And so I did, and although I didn’t make the original version to compare, I think these are pretty darn good. 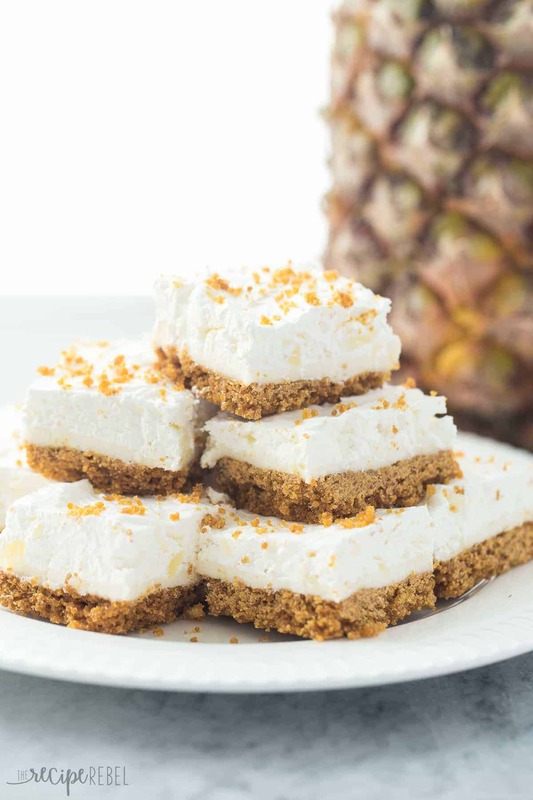 My version of my Mom's Pineapple Squares -- almost no bake dessert that's perfect for Spring or Easter! Light and fluffy and full of crushed pineapple! Preheat oven to 350 degrees and line an 8x8" pan with tin foil. Spray with non stick spray. In a small bowl, melt ¼ cup butter. Stir in graham crumbs. Spread into prepared pan and bake for 8-10 minutes or until dry on top. Remove from the oven and cool completely. Beat remaining ¼ cup butter and 1 cup powdered sugar with an electric mixer. Add 1-2 tablespoons pineapple juice until it comes together and is smooth (you don't want it too wet!). Spread onto cooled crust. Beat cream with an electric mixer on high until soft peaks form. Add 2 tablespoons sugar and continue beating until stiff peaks form. Fold in crushed pineapple and spread onto filling in the crust. Refrigerate for 3-4 hours until chilled and set. Cut into 12-16 bars. *You'll need to whip ¾ cup whipping cream and add about 1 tablespoon sugar to get 1½ cups sweetened whipped cream. Preheat oven to 350 degrees and line an 8×8″ pan with tin foil. Spray with non stick spray. In a small bowl, melt 1/4 cup butter. Stir in graham crumbs. Spread into prepared pan and bake for 8-10 minutes or until dry on top. Remove from the oven and cool completely. Beat remaining 1/4 cup butter and 1 cup powdered sugar with an electric mixer. Add 1-2 tablespoons pineapple juice until it comes together and is smooth (you don’t want it too wet!). Spread onto cooled crust. *You’ll need to whip 3/4 cup whipping cream and add about 1 tablespoon sugar to get 1 1/2 cups sweetened whipped cream. Other recipes that will have you dreaming of Spring! Yes! We love them just as much! 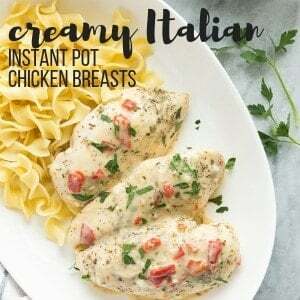 Has anyone ever even MADE this recipe yet??? Comment when you do! These pieces look like they were covered with snow. So cute and beautiful! 🙂 They must taste amazing with some hot chocolate! Mniam! I just discovered your menus for the month and am excited about trying them. I need to get organized in the kitchen and this may help me with that. I also have to clean out my freezer and this should help with that also. Thank you for sharing and the recipes look so good. 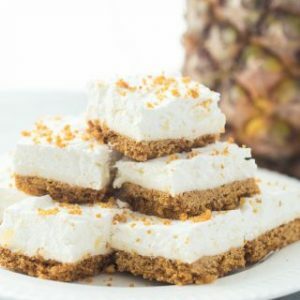 This Almost No Bake Pineapple Squares sounds so delish and with very little effort. My kind of recipe. Thank you again. Thank you Judy! I’m glad to hear you like them so far! Pls confirm to use canned pineapples or fresh ones? I definitely use canned crushed pineapple — it’s a lot of work to crush fresh! The tropical goodness of these bars is just so stunning. Plus anything with mom’s approval is a must. The desserts you have growing up always have a special place in your heart, right? These look so light and fluffy, and I like the sound of the sweet, creamy filling with the tangy pineapple! I can see why you loved these growing up so much! I really like the sound of these; anything with pineapple in is fine by me! They look so pretty too. I just love pineapple anything! So it’s a no-brainer that these bars would be a favorite. Please spring hurry up!! 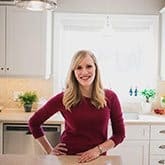 I remember a recipe that was similar that my mom or one of my aunts used to make when I was a kid – those recipes are always the best. These look delicious, and perfect for spring – it’s close enough! I’m always done with winter by the end of February too! Can these be made with cool whip instead of whipped cream? I would think that should work just fine. Yum! These bars make me excited for spring! 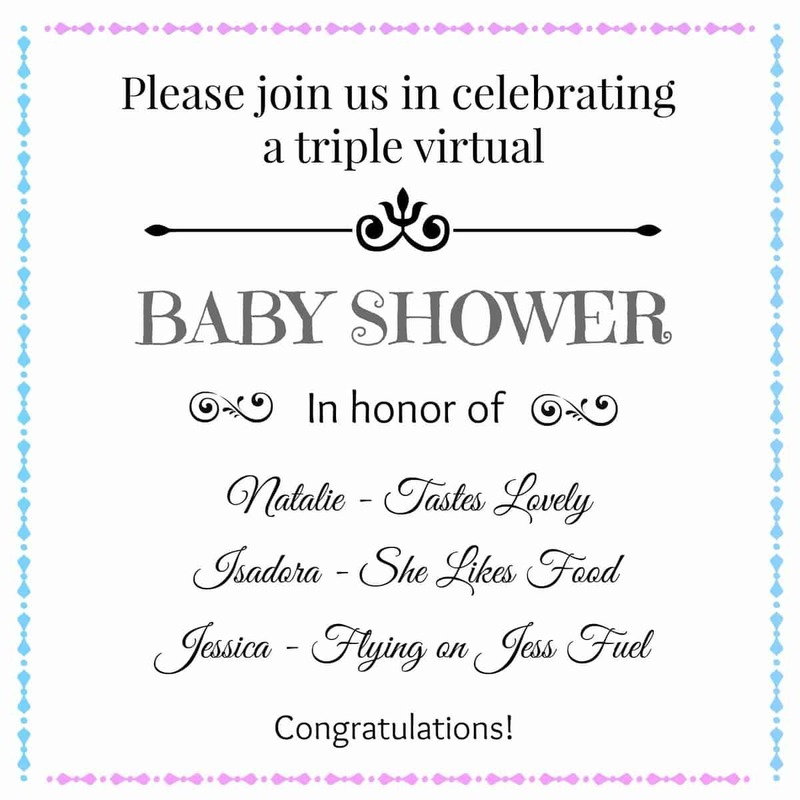 What a great way to celebrate new babies! I love small bites and I love cheesecake and I love pineapple!!! These are awesome! Thanks so much, Ashley! I wish we could all hang out and enjoy the food together! I wish we could, too! Someday we’ll do a retreat 🙂 Then bring on the tasty treats! I love all the tropical flavors I’ve seen today! I so wish we could have had a non-virtual shower so I could taste everything. These look DELISH!! Yes! Wouldn’t that be awesome?! I so can’t wait for May! I love that you are sharing your version of your mom’s recipe 🙂 They look amazing and perfect for a baby shower! I am SO ready for spring and pineapple is the perfect way to bring in some tropical sunshine! Mom’s recipes are always the best, aren’t they? I’ve been in such a pineapple mood lately. 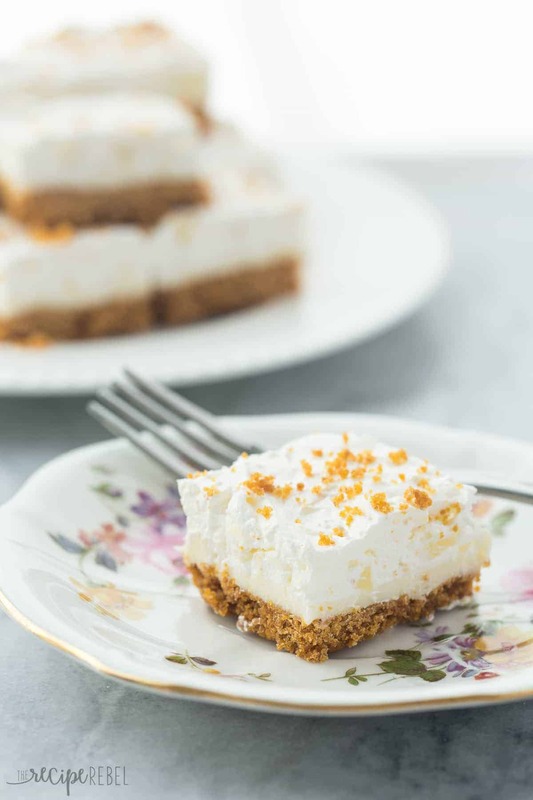 Love this almost no bake treat. Thanks Jen! I love pineapple — it’s so Springy! I don’t think I’ve ever complained about a dessert before. LOL. Who are these people? Desserts are suppose to be sweet! These squares look amazing and yes I’m ready for Spring! 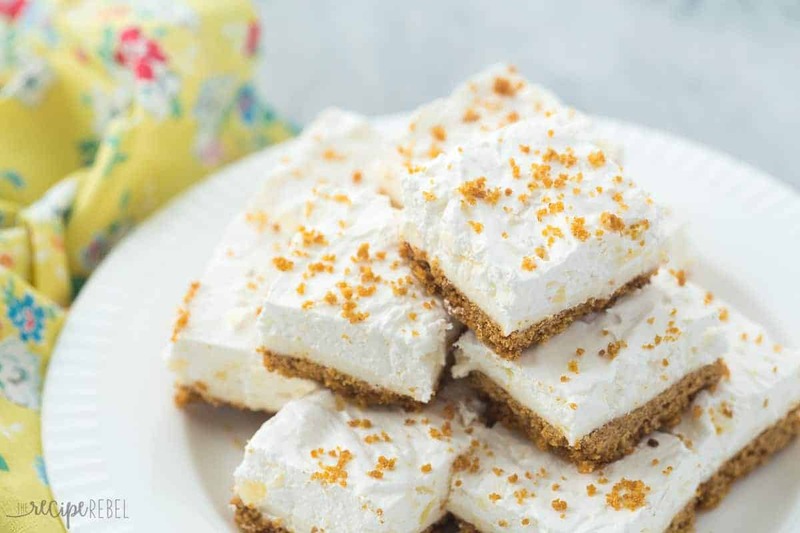 These pineapple squares sound delicious, and I love that it’s your mom’s recipe! 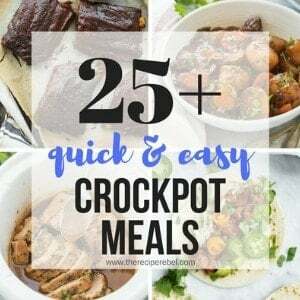 Family recipes are always the best 🙂 and perfect for a big baby shower! Thanks Rachel! I love pineapple desserts for Spring! That is so cool! I feel like there were way more desserts with crushed pineapple made “back in the day”, Lol. I love it! I love these pineapple squares! That fluffy filling is just calling my name. I definitely don’t see enough pineapple treats and these are definitely perfect for a baby shower! Yum! Thanks Gayle! I am all over the pineapple and citrus these days! Ah! Oh my gosh! This is way too sweet! What a wonderful surprise! I am one lucky girl to have such great blogger friends. You’re just the best Ashley! And so are these pineapple squares. Perfect for easter! We’re going to a brunch potluck with family, and these will be the perfect dessert! Thanks Natalie! I have so loved getting to know you and love seeing your sweet Josh!